These easy Red Velvet Brownies are extra fudgy with the perfect red velvet flavor and bright red color. Topped with cream cheese frosting – they’re the perfect Red Velvet Brownie recipe. 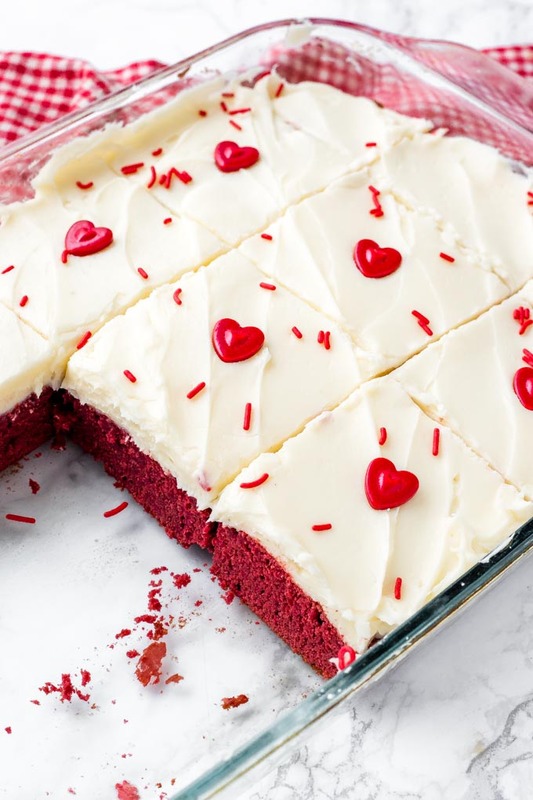 Valentine’s Day is coming and I’ve been planning our Valentine’s Day dinner menu, which will include some of our more elegant recipes, like Easy Baked Salmon, One Pan Garlic Parmesan Pasta and of course the best Red Velvet Brownies for dessert. 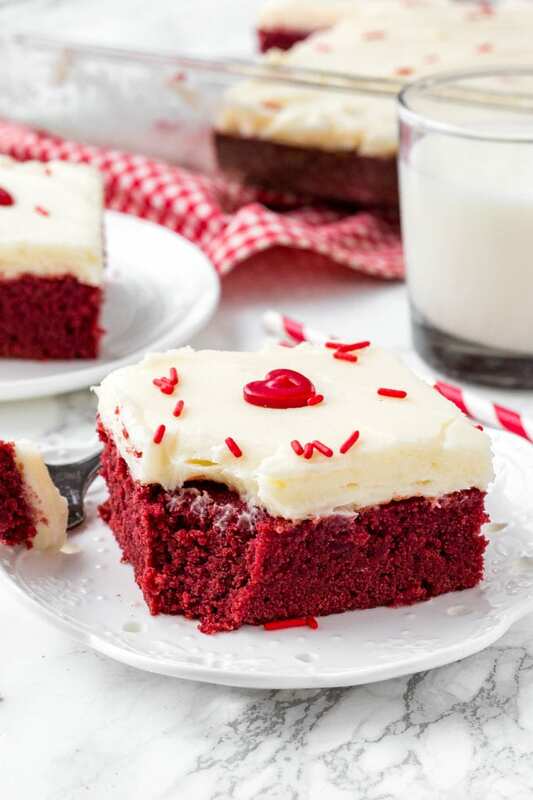 When it comes to these red velvet brownies with cream cheese frosting, you really can’t go wrong. They have a deliciously fudgy, chewy texture with a mild chocolate flavor and beautiful red hue. They have a slight tanginess – and the creamy frosting makes them extra drool-worthy. First, we melt together the butter and chocolate chips. I found that using chocolate chips instead of cocoa powder gave a fudgier texture. Then whisk in the sugar, food coloring and vanilla extract. You can use 1-2 tablespoons of red food coloring. I used 2 tablespoons for the vibrant red color you see pictured. I typically use gel food coloring when I have it available because it packs a bit more punch, but liquid works just as well. Allow the mixture to cool a little (so that you don’t scramble the eggs), and then whisk the eggs in one at a time. Be careful not to whisk the eggs too much – otherwise, you get too much air in the texture which leads to cakier brownies. Then gently fold in the flour, followed by a little vinegar. Vinegar helps to give red velvet its classic flavor that’s almost a little tangy – so don’t leave it out! Bake the brownies for 25-30 minutes at 350F degrees. When they’re done the top should look set and an inserted toothpick should come out clean or with a few damp crumbs. Ovens vary though. Just be careful not to overbake the brownies, or they can get dry. Once they’re cooled, it’s time to get on with the cream cheese frosting. It’s creamy, tangy and the perfect topping for these red velvet brownies. You only need 5 ingredients for this recipe: butter, cream cheese, powdered sugar, vanilla extract & a little salt. Make sure to use full-fat brick style cream cheese (not spreadable or lite). Your butter and cream cheese should be warmed up to room temperature before getting started, but not melty. First beat the butter until fluffy, then mix in the cream cheese. Then with the mixer on low speed, beat in the powdered sugar about 1 cup at a time until it’s smooth and creamy. Frost the brownies once they’re fully cooled (you can pop them in the fridge to speed up the process if you need), then optionally add a few sprinkles on top. I often make these for Valentine’s Day or Christmas – so I’ll add some holiday sprinkles to decorate. 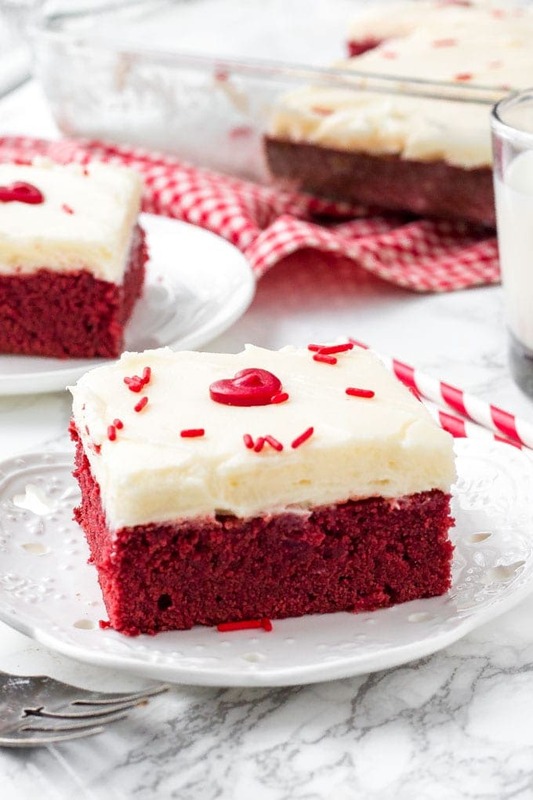 If you aren’t a big fan of cream cheese frosting, you can add in 1 cup of white chocolate chips to the red velvet brownie batter instead for a little extra sweetness. Baked goods topped with Cream Cheese Frosting can sit out safely for 2 hours, after which time they need to be refrigerated to prevent spoiling. These Red Velvet Brownies will need to be stored in the fridge. 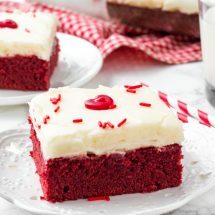 These red velvet brownies with cream cheese frosting are such a decadent treat that are the perfect switch-up for making traditional brownies. 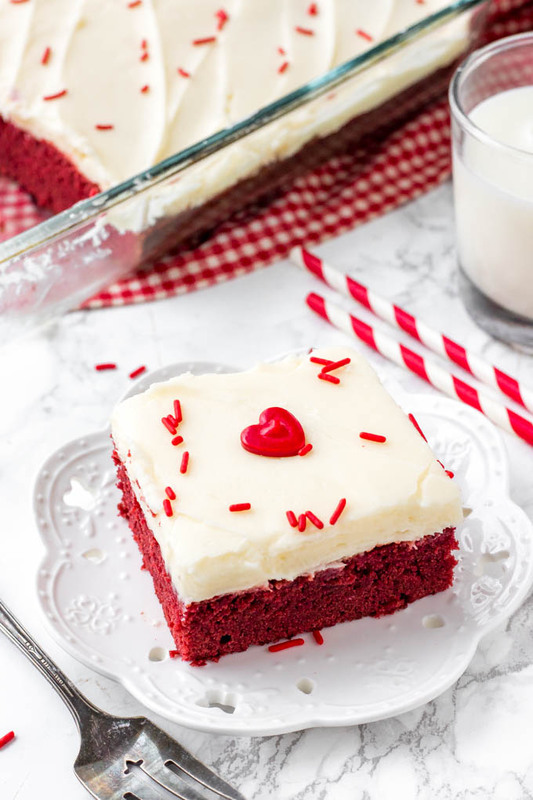 Easy, fudgy, pretty red color & tons of cream cheese frosting! 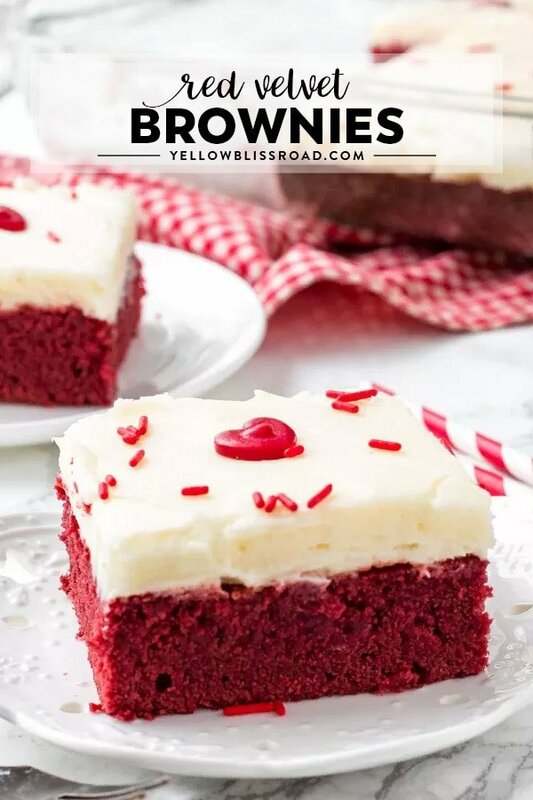 These easy red velvet brownies are extra fudgy with the perfect red velvet flavor and bright red color. Topped with cream cheese frosting - they're the perfect brownie recipe. Preheat the oven to 350F degrees. Lightly grease a 9x13 inch pan. Add the butter and chocolate chips to a large heat-proof bowl. Microwave on medium power for 1 minute. Remove from the microwave and stir. Repeat the process until they're melted together. Whisk in the sugar, vanilla extract & red food coloring. Allow the mixture to cool for a few minutes, then whisk in the eggs. Only whisk until just combined. Gently fold in the flour with a rubber spatula or wooden spoon. Stir in the vinegar. Pour/spoon the batter into the prepared pan. . In a large bowl beat the butter until fluffy (about 2 minutes). Mix in the cream cheese until just combined. Then add in the vanilla extract & salt. With the mixer on low speed, beat in the powdered sugar about 1 cup at a time until the desired sweetness & thickness is reached. Frost the cooled brownies with a flat knife, and optionally decorate with sprinkles. *Store leftovers in an airtight container at room temperature for 2 days, or in the fridge for up to 4 days. These would be great with an Ermine Buttercream, the classic, and authentic, frosting for a Red Velvet Cake. Great idea Bunny! Thank you for stopping by!